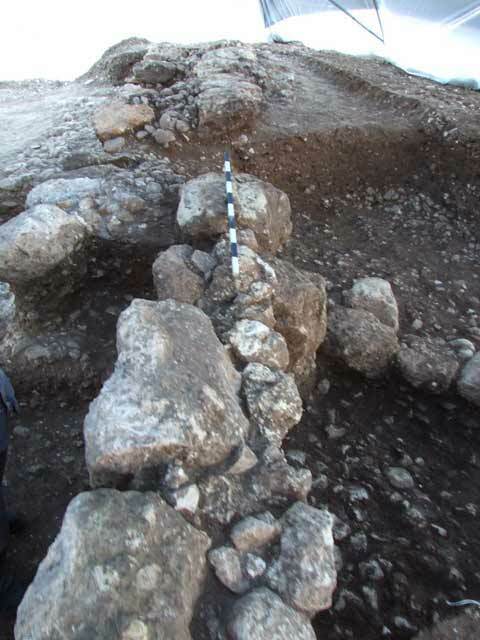 During January 2008, a salvage excavation was conducted at Tel Shimron, west of Timrat (Permit No. A-5334; map ref. NIG 220101–50/734657–733; OIG 170101–50/234657–733), prior to the construction of a henhouse. The excavation, on behalf of the Israel Antiquities Authority, was directed by N. Feig (photography), with the assistance of Y. Lavan and Y. Ya‘aqobi (administration), R. Mishayev (surveying and drafting), R. Vinitsky (metallurgical laboratory), H. Khalaily (flint artifacts) and D.T. Ariel (numismatics). Tel Shimron is located on the fringes of the Yizra’el Valley; the ancient road that linked Legio (Megiddo) with Sepphoris and ‘Akko passed at the foot of the tell. Numerous surveys and excavations had been carried out at the site over the years and traditionally, it has been identified with the biblical site of Shimron (HA-ESI 119). 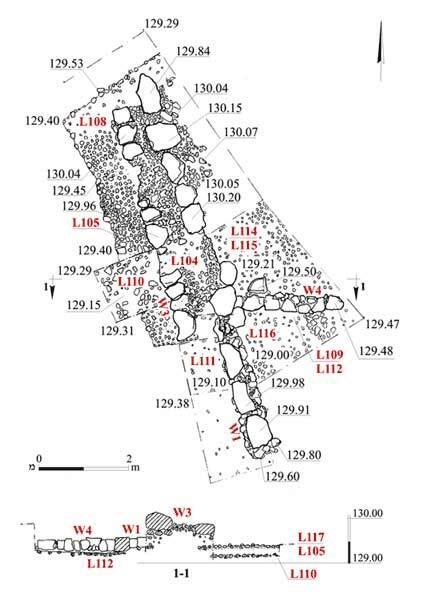 The excavation area (c. 30 sq m) was along the southwestern fringe of the tell and remains of walls and habitation levels were exposed in five strata (I–V; Figs. 1, 2). Stratum V: Two sub-layers (Vb, Va) were discerned. Layer Vb (Loci 112, 115 116) consisted of alluvium, in which small stream pebbles and a large quantity of potsherds were mixed. The potsherds mostly comprised jars, thumb-indented ledge handles and fragments of red-slipped bowls from Early Bronze I and a few pottery fragments from the Intermediate Bronze Age. This alluvium soil was apparent throughout the excavation area (thickness 0.2–0.3 m) and it seems that it slid from the top of the tell down to its foot. Layer Va (Loci 109, 114) comprised heavy brown soil (thickness 7 cm) and lying directly above it was another layer of alluvium mixed with dense stream pebbles, some of which were large, and potsherds from EB I, the Intermediate Bronze Age, Iron II and the Persian period. Stratum IV: A fieldstone wall (W4; exposed length 2.5 m, width c. 0.4 m), aligned east–west and preserved a single course high, was exposed. A stone that may have been part of another face of W4 that did not survive was found adjacent to the north at its western end. Stratum III: Meager remains of a chalk floor (L117; thickness 5–7 cm) that was probably destroyed when the later walls were built were exposed. The floor bedding consisted of very dense small pebbles and potsherds (Loci 105, 108; Fig. 3); it was discovered along the entire western side of the excavation area. 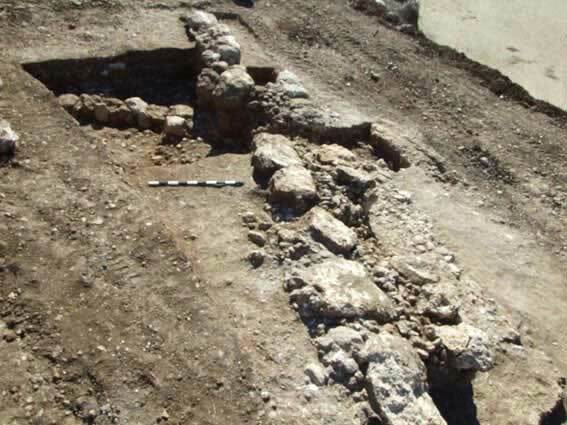 It seems that the floor abutted a wall from the west, which mostly was not preserved and its scant remains were uncovered below a wall that was later built on top of it (W1; see below). Ceramic finds that dated to the Roman period and included a lamp fragment and three bowl rims were discovered on the floor and the bedding. A probe excavated beneath the floor bedding contained a thin layer of stream pebbles and a fragment of an Attic vase from the Hellenistic period (L110). Stratum II: A wall (W1; length 9 m, width 0.7 m; Fig. 4), oriented southeast-northwest, was discovered. It was built of large stones that were smoothed on the side facing west. The wall, preserved a single course high, was apparently meant to hold back the alluvium and it is assumed to have postdated the Roman period. Stratum I: Wall 1 of Stratum II was made thicker with the construction of another wall adjacent to it (W3; length 6.5 m; Fig. 4). Wall 3 was built of medium-sized stones that were placed on their wide side. Fill of stream pebbles and stones was deposited between the two walls. The new wall, composed of Walls 1 and 3, was 1.7–1.8 m wide. The artifacts recovered from the excavation included potsherds, mostly very worn, flint artifacts, stone vessels and a coin. The flint assemblage consisted of twenty-six items, mostly flakes and chips. Noteworthy among them is a massive scraper of light gray flint, covered with a double patina, a modified drill of translucent light brown flint, which enjoyed a widespread use in settlements of the Neolithic period, and a truncated burin of dark brown Eocene flint that was used in the flint industry of the Early Bronze Age. Near the burin were jar fragments and ledge handles that also dated to the Early Bronze Age, although these finds were discovered in an accumulation of alluvium. The stone vessels, recovered from the alluvium layer above W1, included two fragments of basalt grinding bowls and two pounders of hard limestone. The rather worn coin (IAA 115107) was discovered in a soil accumulation above L110. A head is minted on one side of the coin and what appears to be an eagle is struck on its other side. It seems that the coin was struck in the Ashqelon mint during the Ptolemaic period (305–30 BCE). 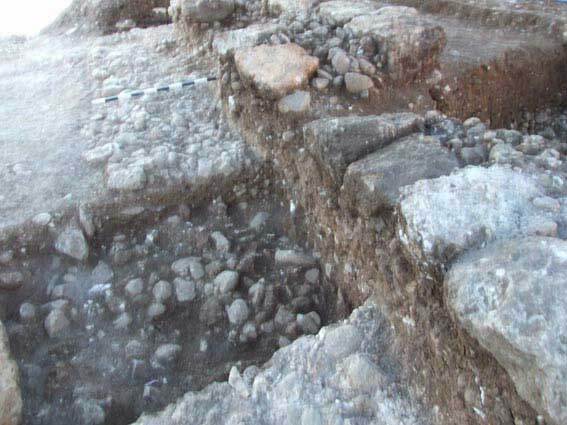 The only architectural remains in the excavation that dated to the Roman period were those of Floor 117 and its bedding. They probably related to building remains that were exposed c. 800 m southwest of this area (HA-ESI 119). The date of other finds in the excavation coincided with dates of remains and artifacts that had previously been exposed and documented in excavations and surveys at the site. 2. Excavation area, looking south. 3. Floor bedding (Loci 105, 108), looking north. 4. Walls 1 and 3, looking north.